As I stated in my last post, I have long wanted to preach on the semi-continuous readings that the Revised Common Lectionary offers us during the Sundays after Pentecost. And over the course of this summer, I will use the blog to reflect on said readings from time to time. Thus, if I were preaching on Samuel somewhere this Third Sunday after Pentecost, here’s how my sermon would read. For these past two Sundays, the readings from 1 Samuel have dealt with the people of Israel’s desire for a king to rule over them so they could be like other nations. The first one was a regrettable choice (as were most of them). We pick up the reading as both God and Samuel have become disillusioned with the leadership of the first king, Saul. I repeat this verse often to myself. It is a constant reminder that what we see is not necessarily what we get, to paraphrase a line made popular by the late comedian, Flip Wilson. It’s worth noting that in Hebrew Scripture the heart is more than just a vital organ of the body. The word translated “heart” is the Hebrew word “levav” which means the inner man, mind, will, understanding, resolution and determination. The heart is the seat of a person’s character, a place of loyalty and faith. God sees in us, what we cannot see in others and, for that matter, even in ourselves. God loves us for our whole being, not as we outwardly appear. And our challenge as people of faith is to try to view others as God views them. Of course, that requires work. It takes more effort and time to know a person’s heart than it does to make a quick decision on outward appearance. We must look beyond the surface to deeper things. I can relate to Samuel and his grief over the unfortunate outcome of Saul’s leadership. This reading has been one of those that I often ponder when I have to identify people to fill certain positions or take on particular responsibilities. I tend to agonize over choices to the point that others think I procrastinate. But even though I know that there’s no such thing as the perfect choice, I want to assure myself that mine is not just a choice of expediency or convenience. The call process is one such situation. We as a staff of the Northeastern Ohio Synod grapple with the task of matching potential pastors’ gifts for ministry with the needs of a congregation that has a vacancy. I pray constantly that the people we send to interview are candidates that not only are pleasing to the congregation, but more importantly, to God. In our Biblical story, the Lord sends Samuel on a strange mission that concluded with the anointing of David as the next king. Samuel didn’t appear all that eager to go and even expresses his fear of going to Bethlehem. I point this out because God seems to always find ways of stretching our comfort zones in order to do God’s will. We are pushed into the new, the unfamiliar, even the scary places and different people. We are challenged to think creatively – outside the box, if you will. In other words, don’t rely on first impressions. What you see on the outside does not always indicate what is on the inside of a person. And Samuel wasn’t the only one who was motivated by first impressions. 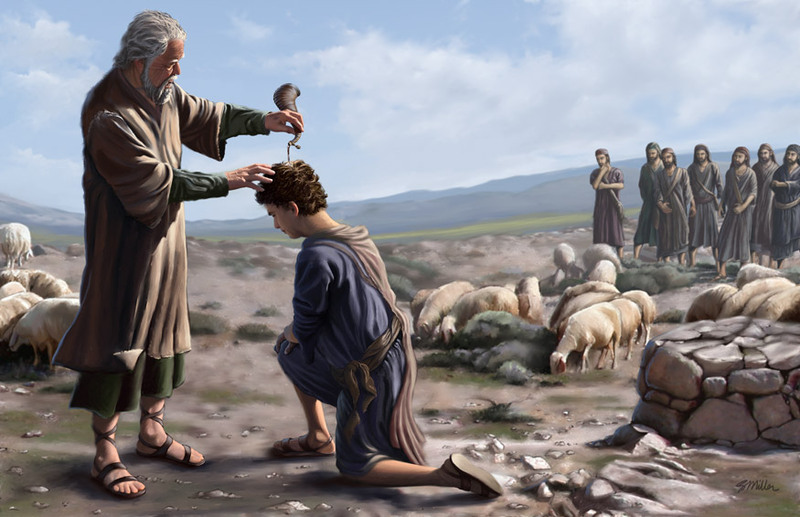 David’s own father, Jesse, didn’t even invite him to the sacrifice, choosing instead to leave him to tend the sheep. The problem is that Samuel is relying on his human sense of vision, which will not do for the work of God. Even Jesse, the father of the eight young men, tries to hinder God’s work by excluding David from the worship service. In so many words, Jesse has made up his mind that because David is the youngest, he’s better off tending the sheep while he and his sons do what’s really important. The message is rather clear. When dealing with matters of God’s actions and will, human sight is an inadequate tool. The human sense of hearing — listening to God — is preferable. Mortals look on the outward appearance. So much so that it blinds us to the will of God. We live in a culture that is oriented to image and appearance. And that becomes our downfall. Advertisers know that the quickest way to get their fingers into our wallets is through our eyes. Every commercial we see, whether in print or in broadcast, is brimming with images of sexuality and excess. We also tend to pick our leaders—politicians, principals, coaches, celebrities, and so on—based on our society’s norms about appearance. We call it by many other names: racism, sexism, ageism, and various other “isms.” None of these are pleasing to God. But God’s word to Samuel is hopeful in such a time as this. It is comforting and encouraging to know that God looks upon the heart and sees past the preoccupation with image and appearance that characterizes our society. God still cares for the marginalized and outcast, and confounds the mighty and powerful, and he asks the same of us. We, in the church must also seek to look on the heart if we are to present an alternative vision to the world and be mediators of God’s grace. To repeat some thoughts from my previous post, we must look beyond appearances in order to grapple with the concerns that address the needs of the human heart. We need only the eyes of faith to see the Lord at work in our world today. Nothing else will be acceptable for the life of God’s people.